Produced in conjunction with Biocom, the October 25, 2018 discussion in South San Francisco explores the capital markets and conditions driving innovative companies forward in Drug Discovery, Services, Tools and Diagnostics. October 17, San Francisco -Slone Partners, the leading executive search firm for life sciences, diagnostics, and scientific healthcare companies, proudly announces Insights: Scientific Healthcare Investing 2018, a panel discussion event taking place October 25, 2018 in South San Francisco. 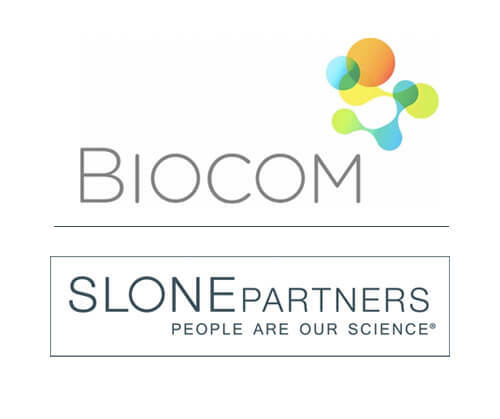 In conjunction with co-producer Biocom, the association representing the life science industry of California, Slone Partners has assembled six prominent venture capitalists who will explore the financial markets and conditions driving healthcare innovation utilizing artificial intelligence (AI), Machine Learning (ML) and Big Data and the future of Biopharma, Tools and Diagnostics. The event is designed to uncover material insights useful to scientific healthcare startups, growth companies, C-level leaders within those organizations, research bodies, and journalists covering the intersection of life sciences, technology and finance. Throughout the year, Slone Partners powers high-profile scientific healthcare discussions, producing dynamic events in Boston, San Francisco, and San Diego, the most important healthcare innovation markets in the U.S., if not the world. At Insights: Scientific Healthcare Investing 2018, the firm continues by examining the impact that artificial intelligence, big data, and technology advances at life sciences, diagnostics and tools firms is having within investment banking, venture capital, private equity, institutional investing, mergers & acquisitions, and Wall Street. The event takes place from 5:00-8:00pm with panel discussion from 6:00-7:30. Networking with panelists and moderator will occur prior to and after the discussion. The location is Biocom Bay Area, Genesis Tower One, 1 Tower Place South San Francisco, CA 94080. Interested audience members may RSVP here. Slone Partners delivers the leaders who build amazing scientific healthcare organizations – People Are Our Science®. Since 2000, Slone Partners specializes in delivering world-class C-suite leadership, senior executive, and board talent to the most established, and the most promising, life sciences, diagnostics, precision medicine, CRO, and laboratory services companies. With coast-to-coast presence in the most active scientific healthcare industry hubs of Boston, New York, San Francisco, Los Angeles, San Diego, Austin, Research Triangle Park NC, and Washington DC, Slone Partners uniquely and precisely provides an array of executive search and advisory services. To learn more about Slone Partners’ retained search practice, visit www.slonepartners.com or call 888.784.3422. Biocom works on behalf of over 1,100 members to drive public policy, build an enviable network of industry leaders, create access to capital, introduce cutting-edge workforce development and STEM education programs, and create robust value-driven purchasing programs. Biocom provides the strongest public voice for research institutions and life science companies that fuel the California economy. To learn more, visit www.biocom.org or call 415.943.9374.